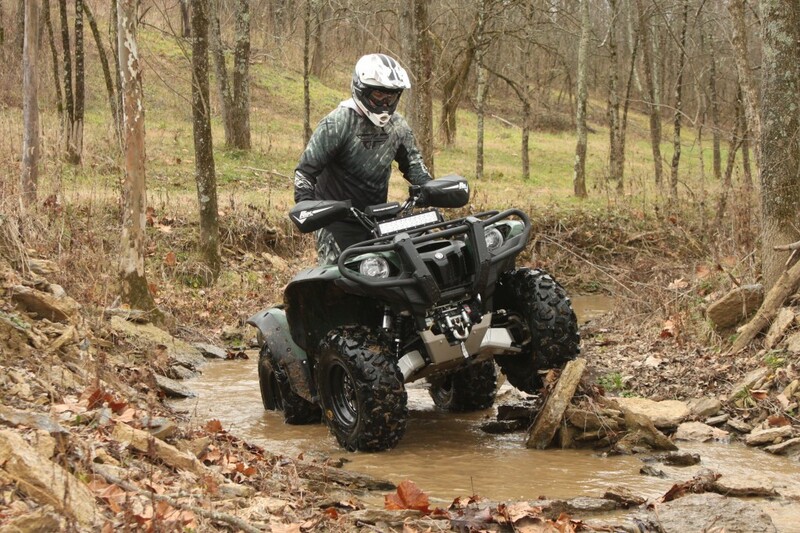 A good set of skid plates is one of the smartest investments you can make in your ATV to help prevent expensive repair bills while enhancing the look of your machine. 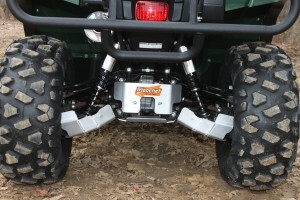 Ricochet’s skid plates are constructed in the USA of 3/16” 5052 H-32 aluminum. Their 10-piece skid plate set for the Yamaha Grizzly 700 covers the entire underside, lower front, and lower rear of the machine. Ricochet attaches their skid plates with rounded, low-profile, T-40, Torx head bolts to help reduce the chances of sheering off a bolt head. Their clamps are constructed of chromoly, heat-treated for strength, and zinc-plated for corrosion resistance. Ricochet attaches their skid plates with rounded, low-profile, T-40, Torx head bolts to help reduce the chances of sheering off a bolt head. 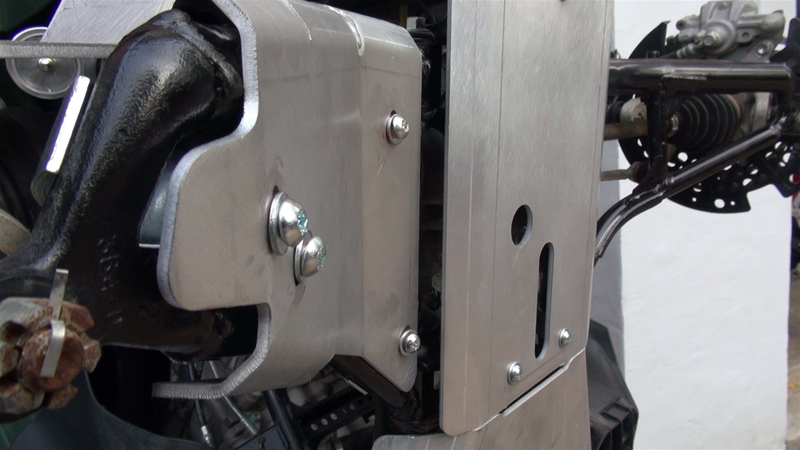 Their clamps are constructed of chromoly, heat-treated for strength, and zinc-plated for corrosion resistance. Ricochet uses high-quality lock nuts, so there’s no need to deal with locking washers or worry about things rattling loose. The hardware comes packaged separately with corresponding numbers for each plate making it easy to figure out what goes with what. 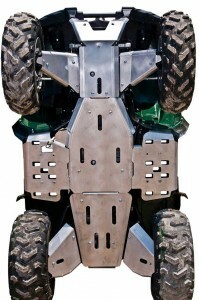 Ricochet’s skid plates are constructed in the USA of 3/16” 5052 H-32 aluminum. Their 10-piece skid plate set for the Yamaha Grizzly 700 covers the entire underside, lower front, and lower rear of the machine. The kit includes full frame skid plates with floorboard protection that wraps around the lower edges of the floorboards. 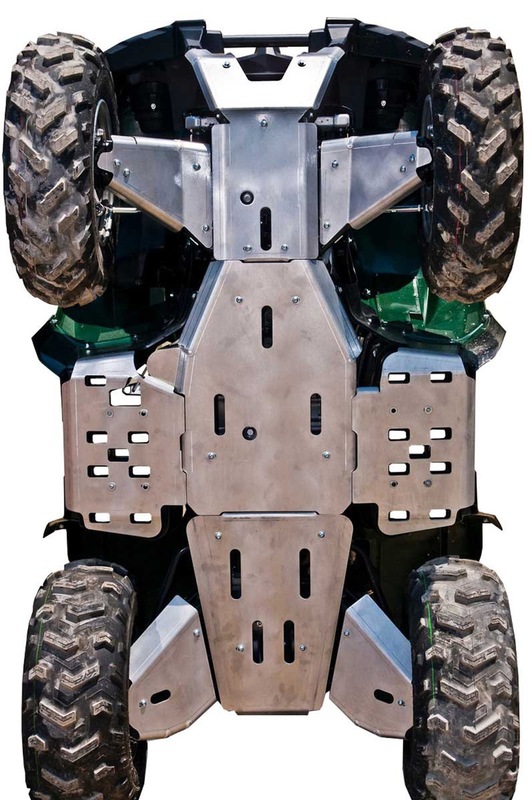 It also comes with skid plates that protect the front and rear A-Arm/CV Boots, and a plate that covers the area over the hitch. The skid plates bolt up beautifully to a stock Grizzly, taking just over an hour to install, and offer a ton of protection. With the wider base of the Works Performance Shocks on our machine, we had to do a little spacing with washers on the rear skid plates and bend the front CV guards forward a couple of degrees to create the needed clearance. Bending the front CV guards forward resulted in the front brakes impacting them on sharp corners, so we had to trim the CV guards down. Again, this custom fabricating was due to the larger diameter Works shocks, so there’s no complaints on our end whatsoever regarding the excellent fitment of Ricochet’s skid plates. For those who want to spice up the looks of their skid plates, Ricochet can anodize them a number of different colors to match the look of your machine. For our test, when it comes to long-term appearance on a part that’s going to take a beating, you can’t beat bare aluminum, as scratches won’t be nearly as apparent. The skid plates bolt up beautifully to a stock Grizzly, taking just over an hour to install, and offer a ton of protection. 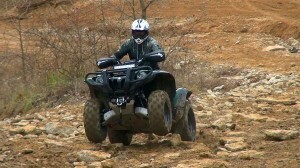 With our Ricochet skid plates bolted up, we headed to Haspin Acres Off-Road Park, located in Laurel, Indiana. 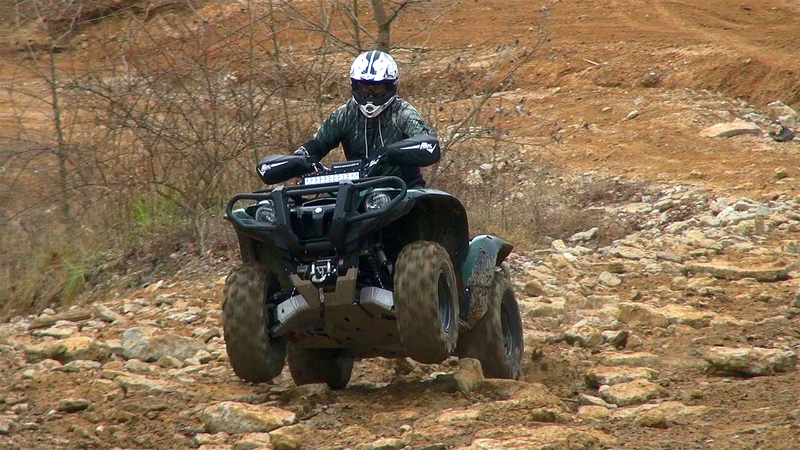 Haspin offers up a variety of terrain, including a few gnarly, rocky sections to put the skid plates to the test. We put our Ricochet skid plates through a couple days of thrashing. 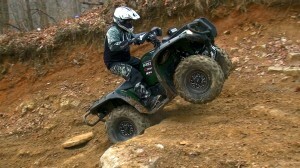 We drug them over rocks, banged them on rock ledges, and framed out in deep ruts. In the end, all our machine suffered was a few scratches in the skid plates. The rounded Torx head bolts seem to do a good job of resisting damage. The only drawback we have found in adding them is that their increased protection for your axles and CV joints result in them collecting more mud and debris. However, the extra few minutes you’ll spend cleaning will pale in comparison to replacing an axle, control arm, or even worse, a chassis or lower engine case. We put our Ricochet skid plates through a couple days of thrashing. it’s easy to appreciate how much more at ease you’ll feel hammering through rocks, knowing you’re not destroying the bottom of your chassis or engine. While it’s difficult to brag to your friends about the performance of your Ricochet skid plates, they’ll notice how good they look. Also, it’s easy to appreciate how much more at ease you’ll feel hammering through rocks, knowing you’re not destroying the bottom of your chassis or engine. If you ride your ATV in or around rocks, skid plates are the number one accessory you can add to protect your investment. 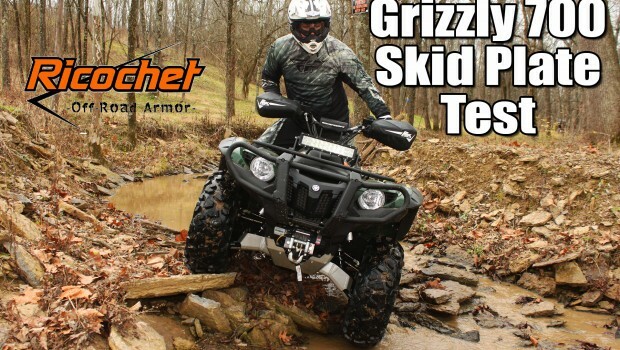 Their good quality, superb fitment, and high level of coverage are all reasons we’d recommend the 10-piece skid plate set from Ricochet for your Yamaha Grizzly 700. Summary: While it’s difficult to brag to your friends about the performance of your Ricochet skid plates, they’ll notice how good they look. Also, it’s easy to appreciate how much more at ease you’ll feel hammering through rocks, knowing you’re not destroying the bottom of your chassis or engine. 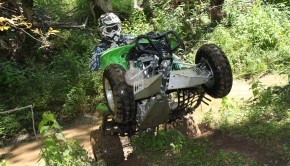 If you ride your ATV in or around rocks, skid plates are the number one accessory you can add to protect your investment. 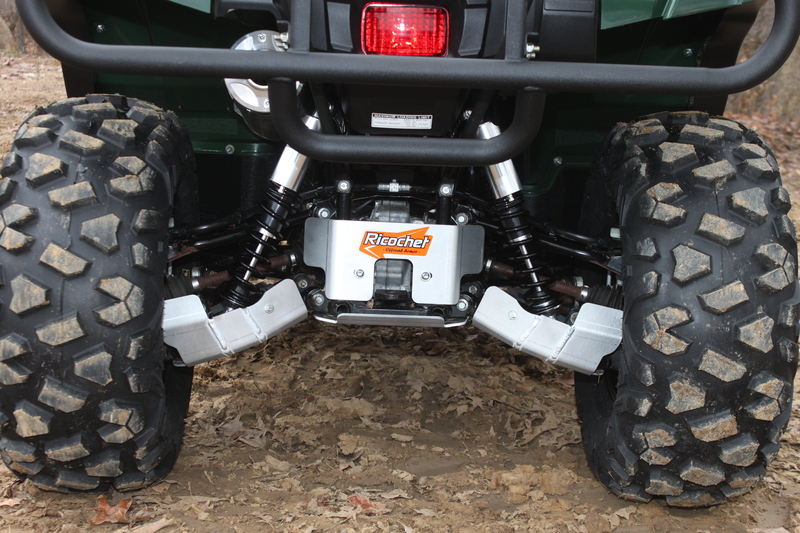 Their good quality, superb fitment, and high level of coverage are all reasons we’d recommend the 10-piece skid plate set from Ricochet for your Yamaha Grizzly 700.